It is 100 years since the first women in the UK won the right to vote in parliamentary elections. It took years of struggle and the largest mobilisation of women in Britain's history to achieve this partial victory. The international executive of the Committee for a Workers' International (CWI, the international organisation that the Socialist Party is part of) took place from 27 November to 2 December in Belgium. The women’s movement across the world is experiencing a big growth. In Europe and the Americas, millions have protested to say no to sexism, patriarchy and capitalism. Video of 8 March rally in Seattle. Click on the link below to watch the video of Socialist Alternative Councilmember Kshama Sawant addressing the rally held in Seattle for International Women's Day. Socialists around the world demand an end to women’s oppression. International Women’s Day: “Solidarity with global mass protests and women’s strikes”. 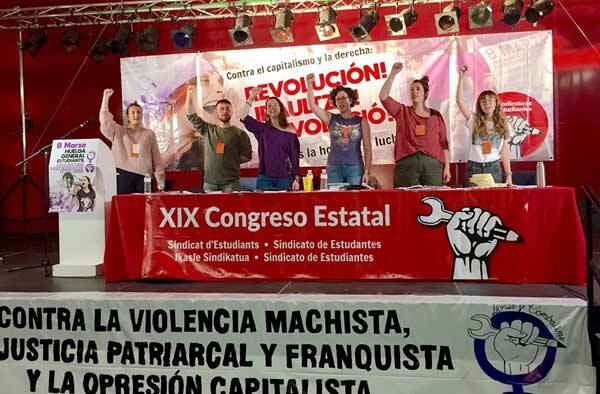 ‘Libres y Combativas’ and Sindicato de Estudiantes call strike against sexist violence and for working class women's rights. Demonstrations world-wide swelled by anti-Trump anger.